Lightweight and durable with low-maintenance-reliability. 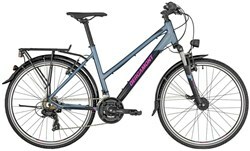 The Specialized Alibi women’s hybrid bike is ready for the streets, and is the perfect partner on your path to a fitter, healthier you. A1 Premium Aluminium frame is lightweight, durable, hardworking, and sturdy. Rack and mudguard mounts add practicality, especially on the morning commute. The Alibi women’s hybrid is engineered with Fitness Geometry for a fast-paced ride, without the discomfort of an aggressive cycling position. 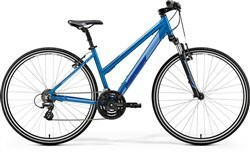 This city bike comes with a step through frame to make mounting and dismounting the bike easier, with a confidence inspiring feel. 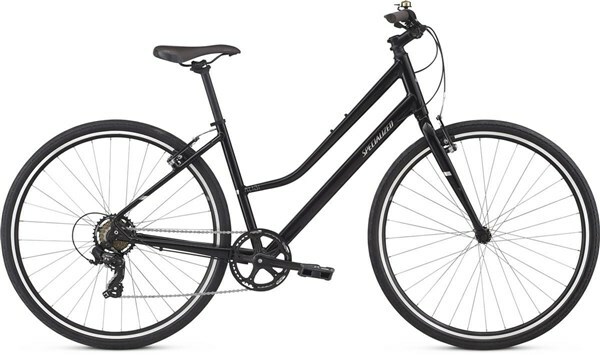 Super low maintenance, the Specialized Alibi is fitted with Nimbus Airless tyres with a puncture proof core. You’ll never have a flat tyre again, and you don’t have to lug around a pump with you. These tyres also offer great traction for on-road safety. The Alibi’s anti-rust chain keeps rolling smoothly, even after a couple of confrontations with the elements, so you can spend more time riding and less time fixing. Super comfortable Body Geometry saddle and grips are 100% designed for women. From the everyday commute to training sessions and leisure rides, the Specialized Alibi is ready to perform. 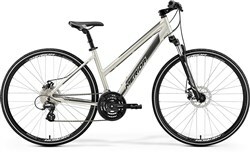 I decided to purchase a hybrid after two years of using my road bike on the 3 mile commute to work. My main reason for doing this is the absurd amount of potholes and bumps and snags I constantly encounter on such a short journey, and the damage it was doing to my bike and the general discomfort of it all. This bike has ensured it is a much more comfortable ride, the tyres are amazing! It is a slower commute now, and I have to take it easier, but I no longer have to get changed out of my leggings when I get to work as most trousers feel comfortable.I think the benefits outweigh the negatives. I'm very happy with my purchase, it's a lovely looking bike and would recommend it to anyone who is happy to take a gentler commute. It's really handy that the saddle height can be adjusted and I manage with the 7 gears. I will probably invest in a pannier rack at some point as well.